Established in 1997, 888sport is the sports betting brand in the 888 group of gaming companies that includes industry leading brands in poker and casino verticals. This should give you great comfort in that you are dealing with a reputable betting provider, but furthermore, they are licensed betting providers in several highly regulated markets including the UK, Italy, Spain and Denmark. This is the real strength of the 888sport betting experience. Mobile and desktop betting through 888sport is so intuitive because the platform is so well-organised, quick, responsive and simple. You really don’t miss a beat or feel any real difference between betting from your computer or betting from your mobile. Once you find ‘Esports’ from the sports navigation at left or within the A-Z mobile button, you will find yourself at a page that will allow access to every available esports event that the offer for betting, through the use of tabs at the top of your page. Live and upcoming events will be listed as the default. If you want to navigate to any particular esports game, it is super easy to do so as all the games are organised in collapsed headers, so you can see them essentially all at the same time. Simply click or tap the header to expand it and see all the available events. You can easily navigate to ‘Outrights’ which contain all the available outright winner betting markets for a wager on the eventual event champion. You can also easily navigate to the ‘All Esports’ header which will take you to a list of all esports games events, again organised under headers for each game. If you ever want to navigate directly to a given match, you can use the search bar to enter a given team or game. 888sport game coverage includes but is not limited to CS:GO, League of Legends, Dota 2, Overwatch, Call of Duty and FIFA. 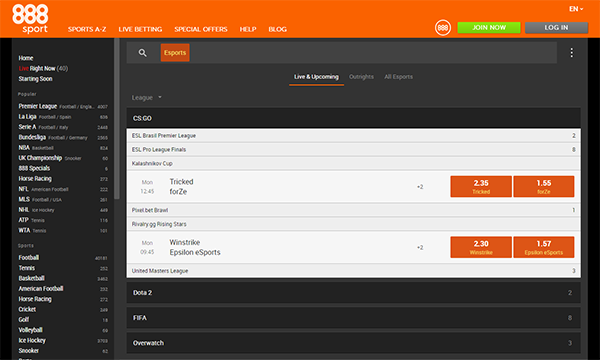 888sport generally keeps to match betting markets and outright winner markets. You will not generally find Totals, Handicaps or other bets as related to the result of the Maps for a given match. Straight match batting (match winner) is by far the most popular market. 888sport rarely has promotions that are specific to esports, but when you visit the site, you may notice a promotion for new customers. Any promotions will be subject to terms & conditions, 18+. Available banking methods always depend on your location. So for example, PayPal is accepted by 888sport, but it is only available for customers in a select number of mainly European nations. Depending on your nation of residence, 888sport accepts credit and debit cards, paysafecard, Astropay, Skrill, Neteller, EcoPayz, Webmoney and numerous bank debit solutions like Sofort, Trustly. Citadel Instant Banking and PostePay. 888sport also offers account currencies in Euros, US Dollars, British Pounds, Swedish Kronor and Danish Kroner. The bottom line: should you sign up with 888sport for esports? If you are interested in simple match winner betting and outright winner markets on the most popular esports events, and you want to play on a super slick platform across all devices with a company that you know you can trust, 888sport will provide all that you need.